Over the decades, Zonta International has grown into a worldwide service organization of executives in business and the professions working together to advance the status of women. There are more than 30,000 members in more than 1,200 clubs in 67 countries all over the world. 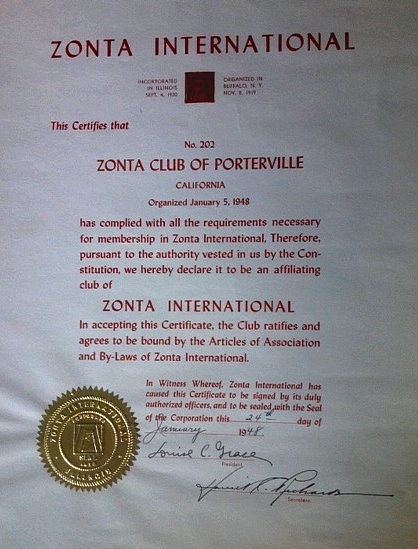 Zonta’s first club was chartered in Buffalo, New York on November 8, 1919. The Zonta Club of Porterville is a member of Area 3 in District 9 (encompasses Arizona, California, Hawaii, Nevada, and Utah). Zonta Club of Porterville, founded in 1948, is a member of Zonta International, a worldwide service organization of members working together to advance the status of women through service and advocacy. Club members are a cross-section of like-minded individuals who volunteer their time, talents and financial support for the betterment of the community and the world through the support of local and international service projects aimed at fulfilling Zonta’s mission and objectives. Over the past 10 years, our club has donated over $160,000 toward community, international service projects and scholarships in addition to thousands of hours towards hands-on projects. Click here to view the club’s contributions over the past ten years. Click here to view the Zonta rose history. Click here to view the Zonta logo history. Zonta Club of Porterville has a 501c3 organization, Porterville Zonta Foundation. 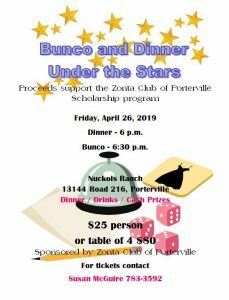 The fund’s primary purpose is to provide scholarships and fund service project that advance the status of women in the local Porterville area, including the Central Family Crisis Center. You can also benefit the Porterville Zonta Foundation by attending An Evening of Art & Wine and the Zonta Christmas Home Tour. Monthly business meetings are usually held, at Rosa’s Italian Restaurant, on the second Tuesday of each month from 12:00 noon until 1:00pm. Monthly program meetings are usually held on the fourth Tuesday of each month. Please click the box below if you would like an invitation to attend the next meeting as a guest.